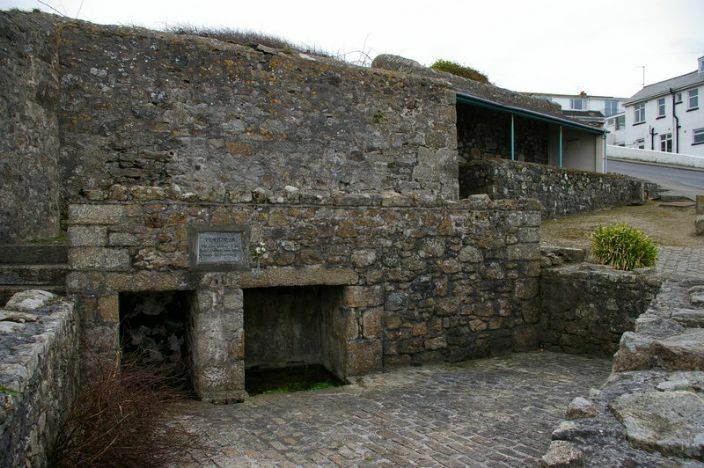 St Ia's Well, or Venton Ia, is opposite Porthmeor Beach in St Ives, on the corner of Porthmeor Hill and Beach Road. It consists of two recesses, each containing a trough of water, and a plaque states: “Venton Ia. The holy well of St Ia, until 1843 the main water supply to Downalong”. St Ia, a 5th or 6th century Irish saint who crossed the Irish Sea on a leaf, gave her name to St Ives, and her holy well is, to this day, a focus of town traditions: the Mayoral Procession on St Ives Feast Day starts from the Guildhall and proceeds to St Ia's well for a service of thanksgiving and blessing of the well, after which the 'hurling the silver ball' takes place – a rugby-like game with an apple-wood ball coated in silver, which has to be dipped into the water of the well. The traditions attached themselves to the well for the obvious reason that the plaque refers to: it was St Ives' main source of fresh water. In 1843 a piped water supply was installed (see OTD), but prior to this date there were only the springs and pumps, of which St Ia's was the main one. Most of them came from mine adits and springs. Who was Richard Penrose, with his designs upon the mine? Was he the St Just tinner who adventured in Wheal Carne in Zennor in 1829? Was he the 41 year old minor living in St Ives in 1841? At the moment he's a bit of a mystery, but one of those mystery men you think you've come across before. And who or what is Rover, burnt in effigy. Is Rover a symbol for a person? Penrose perhaps? Or a symbol of of something else, one of the deadly sins, avarice perhaps? But with the 'old mine called Wheal Ayr' we are on slightly more certain ground. The mine exploited the most northerly of the three main lodes running east-west through the St Ives area and was situated above the Stennack valley on the north side. The mine was also known as Wheal George and by 1860 was going by the name of St Ives East Consols but as yet no production data has been assembled for the mine, other than the fact that it produced both tin and copper. It was an inspection of Wheal Ayr in August 1838, which started the trouble the diary entry refers to. 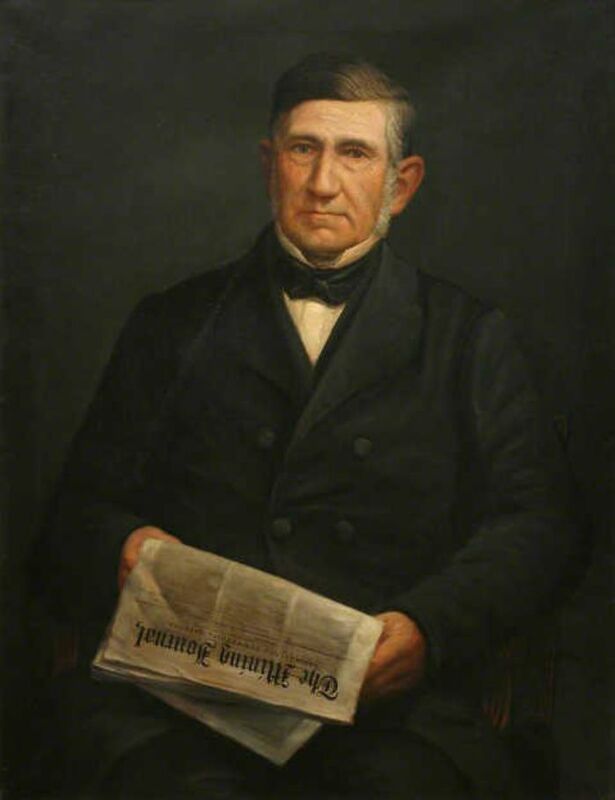 The inspection had been conducted by Captain Charles Thomas, in all probability the same Charles Thomas who oversaw the re-development of the Dolcoath deep levels in the 1840s and the renaissance of the mine as a great tin producer. It took several years and no small effort for Charles Thomas to get Dolcoath back on track and Wheal Ayr was similarly recalcitrant. The water supply having diminished the local people investigated at the mine, found that the water had shifted to the deep adit from the shallow adit, diverted it back into its original course ad persuaded the adventurers to abandon Wheal Ayr. Not until 1844, once piped water had been brought into St Ives, was Wheal Ayr brought back into production.